Brigadier General Tekeste Haile committed crimes against young Eritrean women and men before applying for political asylum in Sweden in protest of the repressive regime of Isayas. On 4 November 2004 48 innocent young men and women at Adi-Abeito prison were killed at Adi-Abeito prison; and also other 161 youth were killed at Wia on 10 June 2005. 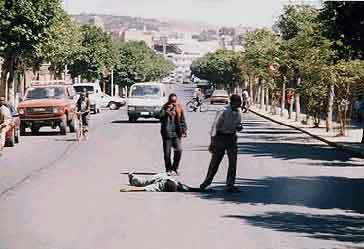 Since 2005 the PFDJ leaders stated to executed innoncent citizen on the public for terrorizing.